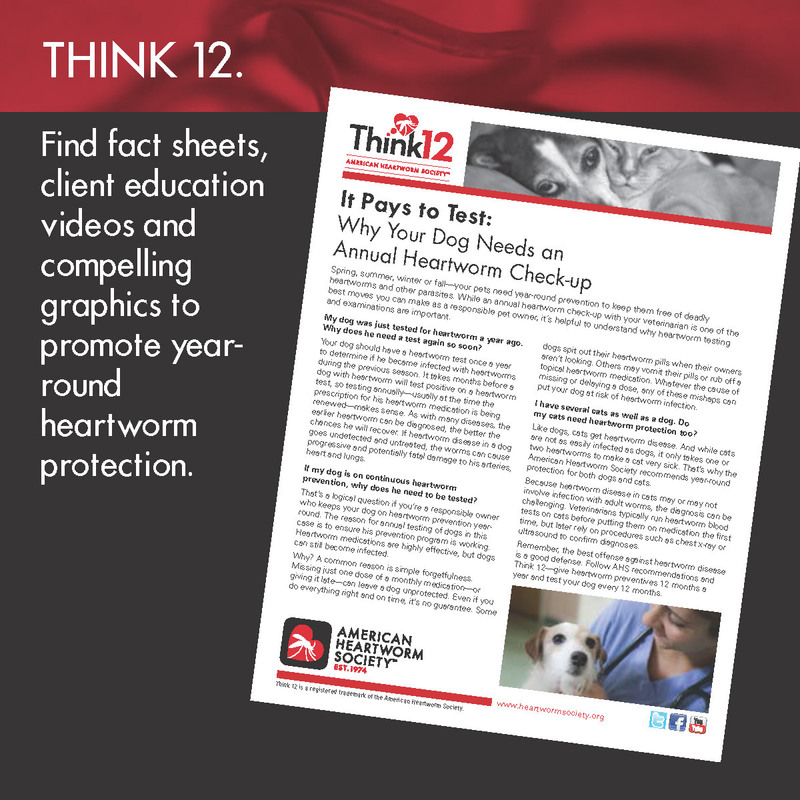 Think 12 is an ongoing initiative through which the American Heartworm Society provides educational materials, including articles, fact sheets, posters, videos and other tools that help pet owners understand the need to administer heartworm preventives 12 months a year and test pets for heartworm every 12 months. 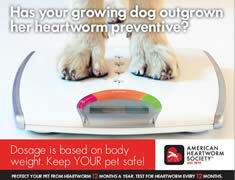 Year-round prevention and annual testing are recommended by American Heartworm Society, and form the foundation of their guidelines for heartworm prevention and diagnosis. New Think 12 materials and tools are produced each month, and are made available to veterinary professionals and pet owners free of charge. Think 12 materials can be downloaded and displayed, printed as handouts—or used in clinic newsletters or on social media platforms. Check the Think 12 Resource Center frequently for new materials or browse through our archives for educational tools on the topic of your choice. 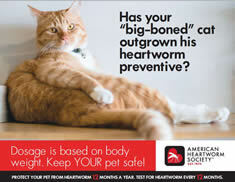 There is no "off-season" for heartworm prevention and treatment. The handouts below make perfect value-added conversation starters with clients and prospective patients. Feel free to print and distribute in your practice. Our beautiful new set of posters make a strong impression. Click on any poster thumbnail below to access a high-resolution version that you are invited to print or share. Click an image below to see a full-resolution version. You may then save the image by right-clicking (PC) or CTRL + Click (Mac) and choosing "Save image" from the popup menu. 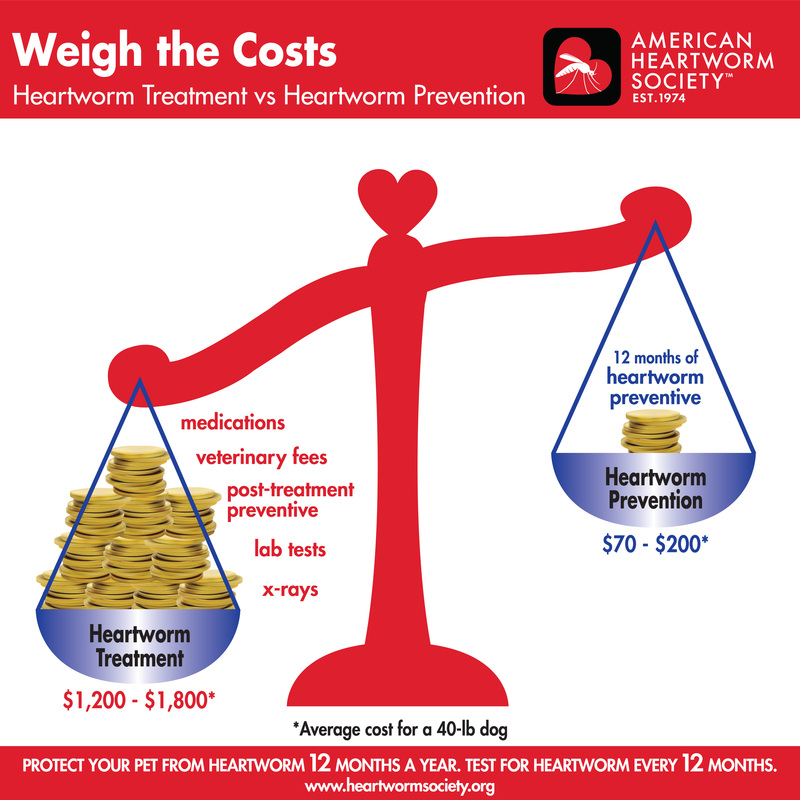 These videos produced by the American Heartworm Society help you communicate the importance of early heartworm diagnosis and prevention. Feel free to post them on your social media platforms to promote your practice and increase understanding.